Over the course of the first 10 games in the series, Mario Party gained a reputation for being—to put it gently—divisive. When things go well, it’s uniquely fun in a way that no other party-style video games (or even physical board games) can really match. It’s Nintendo doing what Nintendo does best, which is milking your nostalgia for its classic cast of characters in a way that is silly, immediately approachable, and allows for a surprising level of skill. On the other hand, there’s also no game that feels remotely as antagonistic as a Mario Party session that simply refuses to go your way. At its best, it’s like a version of Monopoly designed just for you and your friends, but at its worst, it’s like a version of Monopoly where the dice sometimes bite your fingers and set your money on fire. None of that has changed here, and yet Super Mario Party might be one of the best entries in the whole series. One you get into a proper game (which abandons the awful car mechanic of the last few entries), it’s clear that what really makes Super Mario Party shine is the Nintendo Switch itself. It doesn’t use every gimmick that the Switch has in its deep bag of tricks, but it is yet another indication that—unlike Xbox and PlayStation—Nintendo systems are so much more than their technical specifications. For example, what other company would think to use the “HD Rumble” technology in the Joy-Cons to create a little tune that plays from your controller when it’s your turn? Joy-Cons don’t have speakers, so the first time you hear one make a music is pure Nintendo magic. 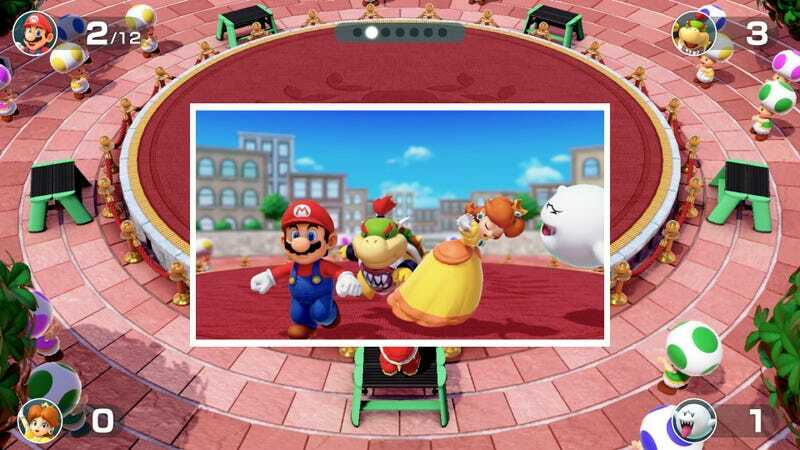 The best minigames will also inspire you to make good use of the Switch’s screenshot button, like one where you try to pose for a photographer while pushing your competitors out of the way and another that requires you and a teammate to accurately recreate Mario’s face with pieces lowered from the ceiling. There are also two separate modes that are all about the motion-sensing tech in the Joy-Cons, with one based all around rhythm games where you shake the controller in time with a beat. The other is a fully cooperative mode where you and your friends paddle a raft down a river, with team-based minigames popping up along the way. Both of them are good palate cleansers for when the core game gets too, you know, unfriendly. That’s all really cool and impressive, but no amount of Nintendo magic can hold the old Mario Party frustrations back forever. It’s a game that’s built almost entirely on random dice rolls and number generators, but it’s hard not to take it personally when the emotionless hand of fate decides to push you down over and over and over again with bad turns and unearned setbacks. The size of the boards in Super Mario Party is also a huge issue, since they’re so small that someone with a very high roll (boosted by bonus dice blocks and a new ally system) could get more than one star in a single turn. A lucky turn of events like that can give one player an insurmountable lead, especially if another player is inexplicably being punished. Super Mario Party seems to be balanced in a way that encourages players to steal stars, which can usually be done at a set point on the map for an extra number of coins, which isn’t an especially satisfying system (and it will also start a lot more real-life fights with your friends and family). The maps are also pretty boring since they’re so small, with each one only having a couple of event spaces that shake things up, which pretty much always means bumping players back to the start. You have to be willing to tolerate that stuff in order to have fun with Super Mario Party, which is apparently the curse that this series always must bear. If you can get past that, though, it’s a game you can play with your best friends/worst enemies that does things you can’t find anywhere else (even in other Mario Party games). Plus, you can play as Monty Mole, which is really cool.